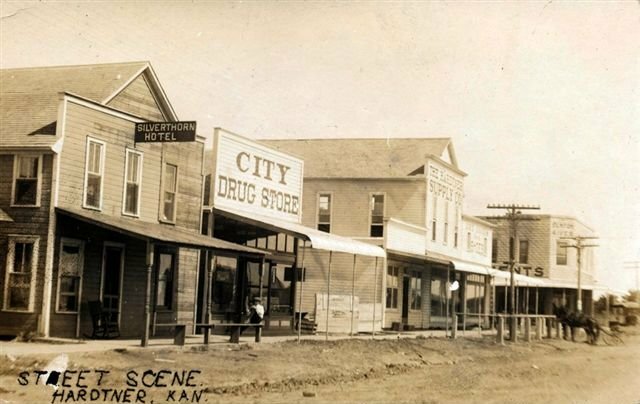 Street scene, Hartdner, Barber County, Kansas, 1912. Photograph from the collection of John Nixon. All rights reserved. "Hartdner, Kansas, 1912: The Benton & Ives building across from the Peoples Bank is still standing. If you head south from there you will see the building where the grocery store is now which was a dry goods & shoe store and then The Hardtner Supply, City Drug Store and then the Silverton Hotel." -- John Nixon, 9 May 2008. From Standard Atlas of Barber County, Kansas, 1905. Hardtner Cemetery The Blue Skyways page. Sketches From the Life History of Jacob Achenbach Includes his eyewitness account of the attempted Medicine Lodge Bank robbery and the subsequent lynching of the miscreants. Hardtner Public Library, P. O. Box 38, Hardtner, KS 67057. Hardtner, Kansas The Blue Skyways page. This RootsWeb website is being created by Jerry Ferrin with the able assistance of many Contributors. Your comments, suggestions and contributions of historical information and photographs to this site are welcome. Please sign the Guest Book. This page was created17 August 2005 and was last updated 14 June 2008.